Small (4-6) - $24.99 Only 1 left! Medium (8-10) - $24.99 Large (12-14) - $29.99 Only 7 left! Throughout the world of mini-ninjas, there are two mighty clans that forever fight against each other for dominance of the Ninjitsu ways. The Legion of the Dragon, stealthy and fast with feats of dexterity that cannot be denied, working towards uncovering ancient relics for mysterious and dangerous reasons. They are contested only by the Ninja Avengers, equally talented masters of kung fu and weaponry, all while maintaining a fashion sense that that is equal part efficiency and avant-garde. Of course, as adults, we have to ask how one secret ninja clan is active throughout the world that we haven’t heard of—much less two of them actively warring against each other! Well, much of the reason for their success comes to the fact that they manage all their techniques at a height that averages a full two feet shorter than the rest of us! Indeed, epic tales are told about the legion of mini ninjas. They are thought adorable, called cute, and, worst of all, underestimated. Their candy-gathering prowess is not to be denied and, even after their successful missions have reached their end, noble Ninja Parents must keep a watchful eye lest this team sneak their own winnings up to their private bedroom lairs to snack upon their joyous rewards. So, it is time to garb your tyke in their mighty regalia to fight for the Ninja Avengers and cease the dangerous acquisition of power (and too much candy) of the Legion. This Leather Ninja costume is the first step to success. 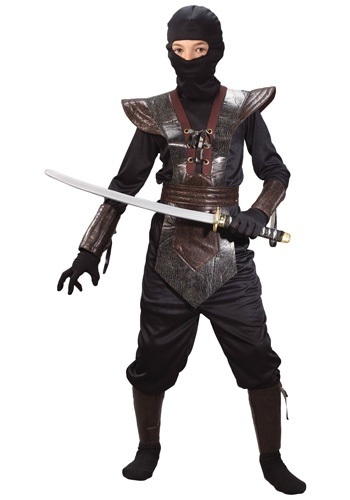 The polyester hood, shirt, and pant combo make for a sleek black base while the polyfoam leather-like tunic slips over to form a black and gray short armor with small pauldrons. Join the armor with weapon accessories and your leather-clad ninja is sure to bring home the greatest of rewards.